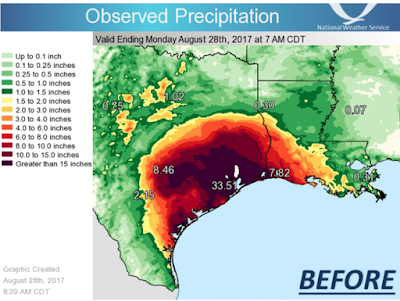 National Weather Service today updated its rainbow colour scheme because of the unprecedented deluge caused by Hurricane Harvey in Texas. 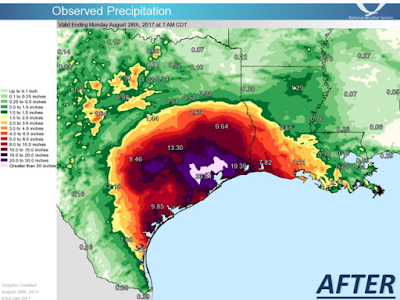 Bravo for NWS in modifying its cartographic approach given a change in the phenomena it's mapping. Except they didn't do a very good job. The previous classification had 13 classes. the new one simply adds two more at the top end to deal with larger rain totals. In fact, all they've done is added detail to the 'greater than 15 inches' class and sub-divided it into three classes '15-20', '20-30' and 'greater than 30'. It'd be pedantic of me to note they still have overlapping classes (they do) but the bigger problem is they retained the same rainbow colour scheme and then added two more colours...a brighter indigo and then a pale pink. Does that light pink area in the new map above look more to you? Or perhaps a haven of relative stillness and tranquility amongst the utter chaos of the disaster? Yes, the colours are nested and so we can induce increases and decreases simply through the natural pattern - but the light pink could just as easily be seen as a nested low set of values than the more it is supposed to represent. For a colour scheme that is trying to convey magnitude...more rain...more more more, you need a scheme that people perceive as more, more, more too. Different hues do not, perceptually, do that. Light pink does not suggest hideous amounts of rain compared to the dark purples it is supposed to extend. We see light as less and dark as more. Going through a rainbow scheme where lightness changes throughout (the mid light yellow at '1.5-2.0' inches is a particular problem) isn't an effective method. Simply adding colours to the end of an already poor colour scheme and then making the class representing the largest magnitude the very lightest colour is weak symbology. But then , they've already used all the colours of the rainbow so they're out of options! The very least they should have done is re-calibrated the classes to make the largest class encompass the new, out-of-all-known-range range. You can't simply add more classes when you're already maxed-out of options for effective symbolisation. Better still, look around and learn how it should be done. The Washington Post has made a terrific map using a colour scheme that does have a subtle hue shift but whose main perceptual feature is the shift in lightness values. So we see more, more more as the colour scheme gets darker. It's simple. it really is. The scientific community continues to use poor colour schemes and poor cartography to communicate to the general public. At least the mainstream media is doing a much better job. 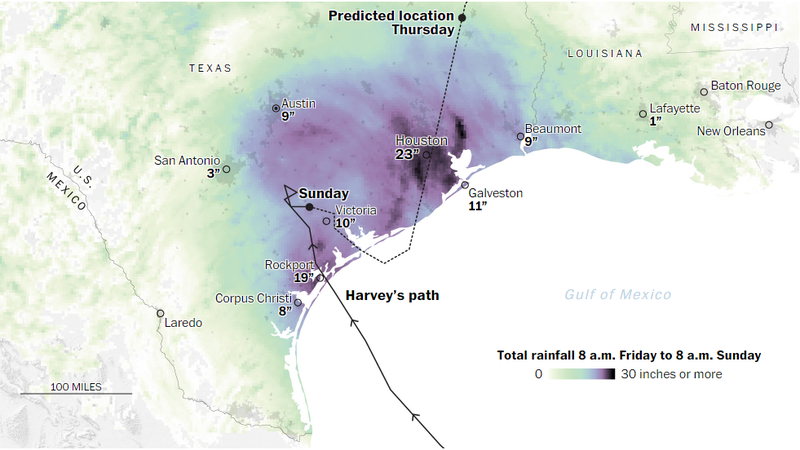 New York Times today published one of the best maps I have seen in a long while. 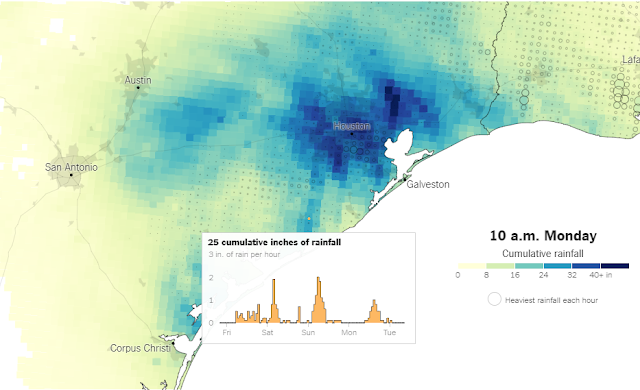 I mean 'best maps' of anything, not just the continuing deluge in Texas. Its simplicity belies its complexity and that's the trick with good cartography. Here's a pretty lo-res grab but go to the site and take a look. They've got the colours spot on, A slight hue shift to emphasize light to dark but cleverly hooking into the way in which we 'see' deeper water as darker blue. Of course, it isn't really deeper blue but the way light is reflected, refracted and absorbed by water gives us that illusion. So, it acts as a visual anchor that we can relate to. There's other symbology too - small gridded proportional circles that show the heaviest rainfall in each hour. The map is an animation so this gives a terrific sense of the pulsing nature of the movement of successive waves of rain (literally, waves!). The colours morph towards the higher end as the animation plays to build a cumulative total. This also has the effect of countering the natural change blindness we see when we're trying to recall the proportional symbols. The two symbols work in harmony. And then, for those who want detail a hover gets you a graph showing the per hour total over the last few days. These aren't the only maps in the NYT piece. The article is full of them. Each one carefully designed to explore a specific aspect of the disaster: the history of storms, reports, evacuations etc. It's maps like those from The Washington Post and New York Times that prove that good cartography does exist and it matters. We really don't deserve the sort of maps that NWS pumps out. They're just really awful to look at, fail on a cognitive level and prove they haven't the first clue about how to effectively communicate their own science and data. The irony is that the NYT map uses the NWS data of the rainfall data to make their own version and prove that it's perfectly possible to make terrific maps that communicate and which once again give us more reasons to #endtherainbow. Well played. I make maps as part of my job but wouldn't call myself a cartographer by any stretch. While editing a colour bar this morning it occurred to me that the NWS might not have that option. The poor guys are working with a colour scheme that may have been defined years ago. 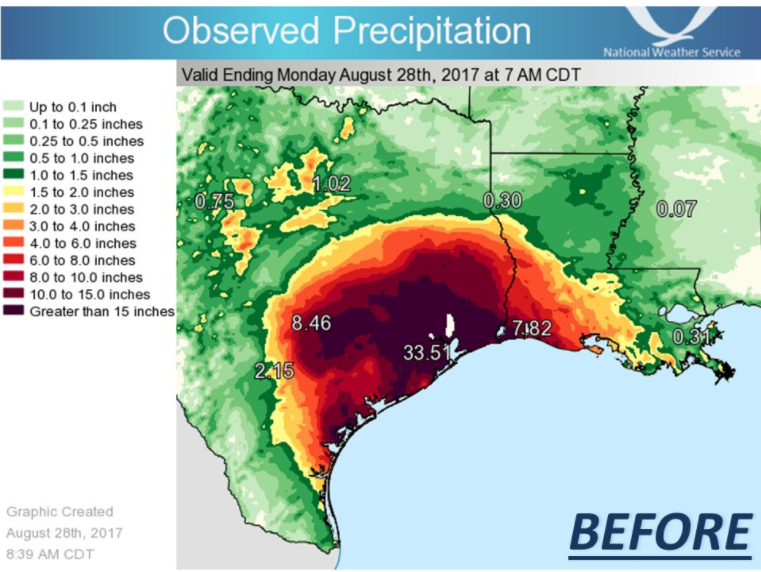 They didn't have all the data when they started mapping the rainfall while it was still happening. If they'd changed the colour scheme it would make it inconsistent with all the maps they'd previously published for this event, not to mention the historic maps. I'm behind your call to #endtherainbow, it took me a few years to figure out that the default on my software doesn't serve my message best, shortly before I stumbled upon your blog. But it's probably out of their hands.